When it comes to milking a gamer’s wallet for all it is worth, gaming companies certainly know the ins and outs, and would do so without so much so as batting an eyelid. Well, Sony’s an old hand at the video gaming scene now with three home-based consoles under their label now (with a fourth in the works, or so that is what we heard on the grapevine), and have just announced the PS3 Wireless Stereo Headset. Of course, Sony would market this to be no ordinary headset, as it claims to let you hear your enemies approach you in the game before they are even able to see you – crucial moments, especially if you deal with a lot of FPS games. More on the PS3 Wireless Stereo Headset in the extended post, and whether it is going to be worth the money you fork out for it or not. 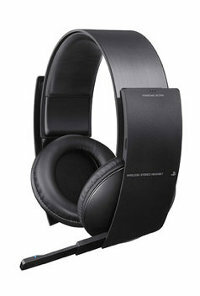 It won’t be available immediately, but rather, you will have to wait until this September as the PS3 Wireless Stereo Headset is accompanied by a $99.99 price point. This official gaming gear from Sony will support a wide range of favorite franchises amongst gamers, including (but not limited to) Killzone and Gran Turismo. Not only that, you will be pleased to know that this was specially designed for surround sound audio. With 7.1 virtual surround sound running audio proceedings from within, the Wireless Stereo Headset is capable of letting you hear all the minor in-game audio clues clearly, regardless of whether you are currently involved in a firefight in a FPS or pressing the pedal to the metal for that elusive checkered flag. Anyone who has worn low quality headphones in the past ought to be able to let you know just how uncomfortable the experience can get after a while – not only do your ears feel all hot and bothered, some of you might even develop rashes. Not so with the PS3 Wireless Stereo Headset, as it was specially designed with comfort in mind for hours of non-stop gameplay, making it the perfect addition to your PlayStation experience. Hooking up the Wireless Stereo Headset with PS3 is a snap thanks to the accompanying USB Wireless Adapter. You will then be able to access precise volume controls and accessible microphone mute so that there is no need to interrupt gameplay just to look for a particular button. Essential information such as battery status and sound controls are always within reach, making this one of the newer ways to get even more immersed in today’s games.